I was introduced to blue and white transferware pottery by my mother and grandmother. We ate off of my grandmother’s blue Willow plates, which were made in occupied Japan. My sister still has them. I remember going to antique stores with my mother from the time I was five. 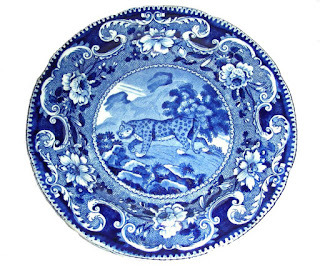 My mother (now 92 and still a blue lover) liked all kinds of china, but especially flow blue and old blue transferware. I liked old blue too. I bought my first piece of blue when I was a teenager. An addiction was born! In 1990, I was told by my husband that I must either become a transferware dealer or stop collecting. What a no-brainer! This was when Merlin Antiques was born, named after my favorite black and white cat. I would have liked a blue and white cat. Merlin brought me treasures; nothing dead. His treasures included shoes, shirts, hats or anything else left outside by my neighbors. Unfortunately, no jewelry. Above is a photo of one of my favorite patterns. 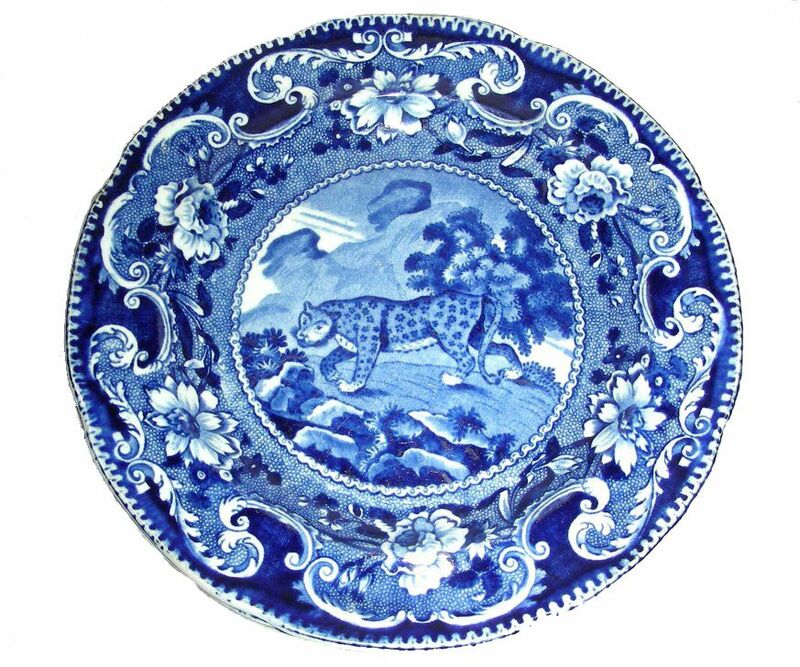 It is the leopard pattern from Enoch Wood & Sons (1818-1846) Sporting Series. There are at least 34 center patterns in this huge dinner service. More about this service at a later date.